Make your own custom printed 3 ring binders using Fastbind's ring binder blank sets. 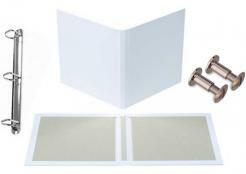 Case Express 3 ring binder blank cases come in sets of 10 per box. Each set contains: 10- 3 ring mechanisms 10- matching blank case w/pre-drilled ring mounting holes 10- sets of nickel plated screws & posts.